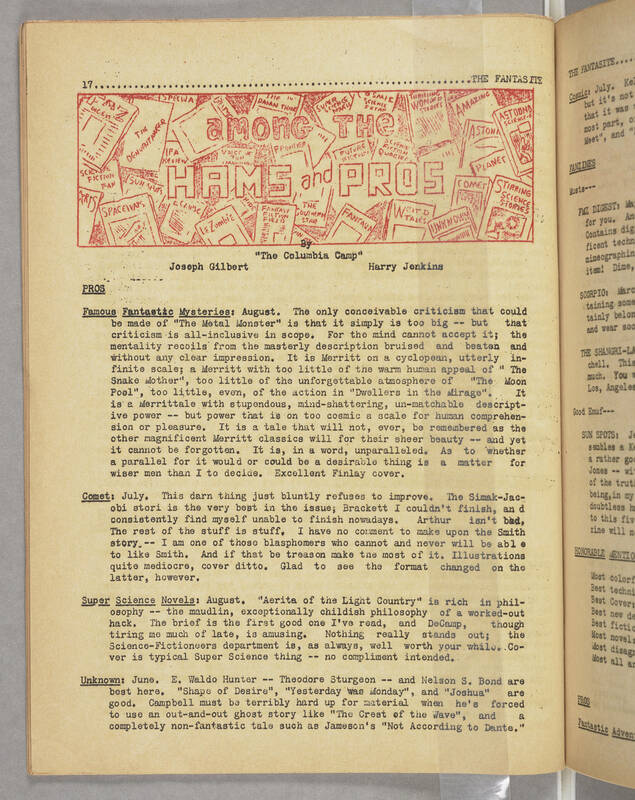 17 THE FANTASITE among the HAMS and PROS by "The Columbia Camp" Joseph Gilbert Harry Jenkins PROS Famous Fantastic Mysteries: August. The only conceivable criticism that could be made of "The Metal Monster" is that it simply is too big -- but that criticism is all-inclusive in scope. For the mind cannot accept it; the mentality recoils from the masterly description bruised and beaten and without any clear impression. It is Merritt on a cyclopean, utterly infinite scale; a Merritt with too little of the warm human appeal of " The Snake Mother", too little of the unforgettable atmosphere of "The Moon Pool", too little, even, of the action in "Dwellers in the Mirage". It is a Merrittale with stupendous, mind-shattering, un-matchable descriptive power -- but power that is on too cosmic a scale for human comprehension or pleasure. It is a tale that will not, ever, be remembered as the other magnificent Merritt classics will for their sheer beauty -- and yet it cannot be forgotten. It is, in a world, unparalleled. As to whether a parallel for it would or could be a desirable thing is a matter for wiser men than I to decide. Excellent Finlay cover. Comet: July. This darn thing just bluntly refuses to improve. THe Simak-Jacobi stori is the very best in the issue; Brackett I couldn't finish, and consistently find myself unable to finish nowadays. Arthur isn't bad. The rest of the stuff is stuff. I have no comment to make upon the Smith story -- I am one of those blasphomers who cannot and never will be able to like Smith. And if that be treason make the most of it. Illustrations quite mediocre, cover ditto. Glad to see the format changed on the latter, however. Super Science Novels: August. "Aerita of the Light Country" is rich in philosophy -- the maudlin, exceptionally childish philosophy of a worked-out hack. The brief is the first good one I've read, and DeCamp, though tiring me much of late, is amusing. Nothing really stands out; the Science-Fictioneers department is, as always, well worth your while. Cover is typical Super Science thing -- no compliment intended. Unknown: June. E. Waldo Hunter -- Theodore Sturgeon -- and Nelson S. Bond are best here. "Shape of Desire", "Yesterday was Monday", and "Joshua" are good. Campbell must be terribly hard up for material when he's forced to use an out-and-out ghost story like "The Crest of the Wave", and a completely non-fantastic tale such as Jameson's "Not According to Dante."